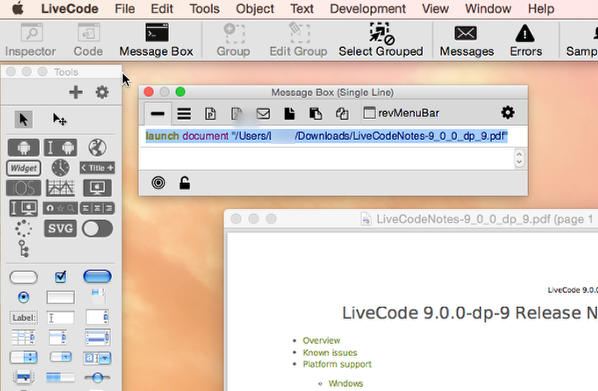 LiveCode LessonsLiveCode LessonsHow To - Step-By-Step Guides To Tasks In LiveCode Creating User InterfacesHow do I display a PDF in LiveCode? There are occasions when you might want to be able to display a PDF document in your LiveCode application, for example a help file. In this lesson we will look at different ways you can do this. 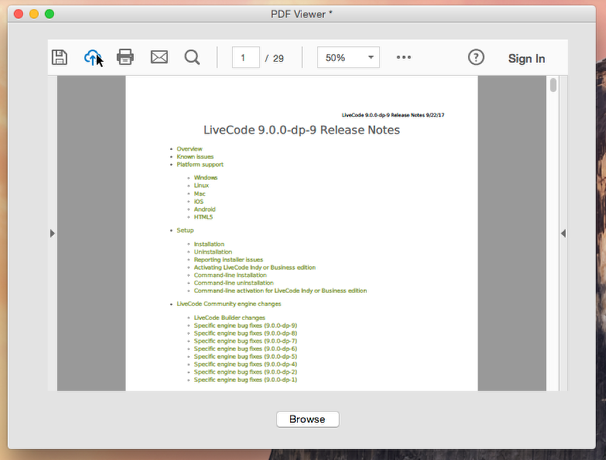 The simplest way to display a PDF from within LiveCode is to use the launch document command. This opens a document with the operating system's default program. But what if you don't want to display your PDF in a external window? You can use a browser widget to display PDFs within a stack. answer file "Please choose the file you would like to display" with type "PDF document|pdf|PDF"
Switch to Run mode and try selecting a PDF file. 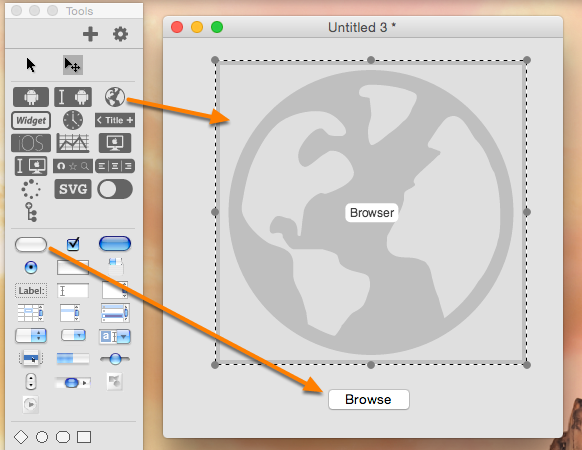 Hi tb, I've just done a quick test here and this works ok in 8.1.6 and 9.0 on Mac. What version of LiveCode and OS are you on? There is a known issue where the browser widget does not work on 32-bit Linux. Everything works perfect if I open a url-adress outside of my Mac but if I try to open a pdf document on my System it doesn't (and the address is a file not an url). Hi tb, it turns out there is a bug with PDF filenames that have spaces or Unicode characters. Could this be what you are experiencing? So we can investigate further. What I find confusing is that the line replacing the | is required yet the | does not seem to be in the file name. Also, please will LC confirm if Elanor is correct re Unicode as the work arounds seems to be dealing with so called "unsafe" 8 bit (1 byte) ASCII characters such as space rather than unicode. "URL encoding replaces unsafe ASCII characters with a "%" followed by two hexadecimal digits." Please note that using the LC function URLEncode does not work with either of the browsers. My limited research indicates that MAC OS uses UTF8 character encoding in filenames whereas Windows uses UTF16 which implies that Livecode is translating filenames when it returns a value in the it variable. I'm not sure of the implications but worry that my workaround is to simplistic. Probably a kludge and there may well be other characters waiting to trip me up. The short answer is the use textencode the file name using UTF8 on mac and UTF16 on PC, then use the URLEncode function and pass the result to the browser. Thanks you for your comments, I have added a line to the lesson to manually encode spaces in filenames which should allow the user to select a PDFs with spaces in their names. Thank you for adding your comments to the bug report too. so the workaround you are using is the best solution for now. LiveCode 9 still seems to have this bug. I tried to use Robert Caillious function with "äöüÄÖÜ;,? !àèé " but is seems that there are still hidden characters that don't get caught. Is there any possibility to get those? Hi Till, what issue are you seeing, I tried converting "äöüÄÖÜ;,? !àèé " using Robert Cailliau's function and then converting the result back using urlDecode and got "äöüÄÖÜ;,? !àèé " again. Which particular characters are causing problems? You might be able to customise the MyURLEncode function to include more special cases for this characters.